Started off March proper with Shrove Tuesday, like a boss! Made many tasty pancakes.. man is it good to be paleo-free. Also, as I’m trying to do 30 days of waking up at 6am, we actually had the pancakes for breakfast! An otherwise-unheard-of meal in our household. Will post soon about how my early starts panned out. Early in the month, we celebrated my wee niece’s birthday! Handsome S & I practiced our balloon-sword-making skills for her party. We’re pretty much amazing now. We also stopped by S’s dad’s after to check out the epic back garden frog action (pictured above!). We owned our city. Went to a couple Farmers’ Markets, including the newish one in the Grassmarket (run by the same folk who do the Stockbridge Market, apparently?). Topped it off with a trip to Mary’s Milk Bar for milkshakes even though it is freezing still; SUCH a cute wee place with really cool style (and yummy shakes)! Also, although we are in economy-drive-mode, my loving husband met me with affogado from Affogado, and we had a tasty dinner with pals at Cross + Corner on their moving-out day. Nom! +5 flavors at Wings bringing me to a grand total of 22 so far! Nearly there! +2 hrs karaoke with pals I haven’t seen in ages. On a Saturday afternoon no less. I spent a huge chunk of the month (and my early mornings) doing freelance transcription for an interesting research project at work (related to the Scottish Independence referendum). Paid overtime + learning for free = ideal! I’m really looking forward to the vote in September, although I can’t participate myself (not a citizen, and not from an EU country – despite being a resident here and married to a Scot). We’ve progressed further with our house-buying and potentially have a winner! Fingers still crossed as ever that everything works to plan. House buying is the absolute pits, I’ve decided! But I am ever the optimist. 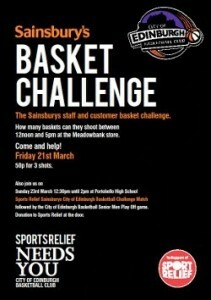 Speaking of charity – later in the month I participated in a day of basketball training for Sports Relief with my basketball org, playing with/against employees from Sainsbury’s. Fun times for a Sunday – and for a good cause! Looking forward to our trip to LA and trying to get that organized (car rentals, etc). Dreaming of all the things I’m going to eat! Any recommendations? And listened to David Sedaris, Let’s Explore Diabetes with Owls, on tape in the car. And that’s all for March madness!